Fairfield is a city of 10,000. For a city this size our electric car showcase event was very successful. All three of our local newspapers showed up along with a candidate for Mayor. We decided not to give rides at the event because all of the cars were surrounded with onlookers the entire event time. After the event a few of us gave really interested attendees rides. Next year we look forward to hosting the event in the town square and triple the number of available electric cars to look at and have a fleet of electric cars that will give test drives. Our local Ford dealership was not interested in working with us because (they said) electric cars are not popular. We hope to change that. Several of our attendees plan to go to the dealership and let them know they are interested in test driving an electric car. We had a booth with flyers about electric cars, climate change, "How to Lobby" and "How to write a letter to the editor". Our goal was to educate citizens about the link between the changing climate and the huge effect transportation is in the wholistic picture. 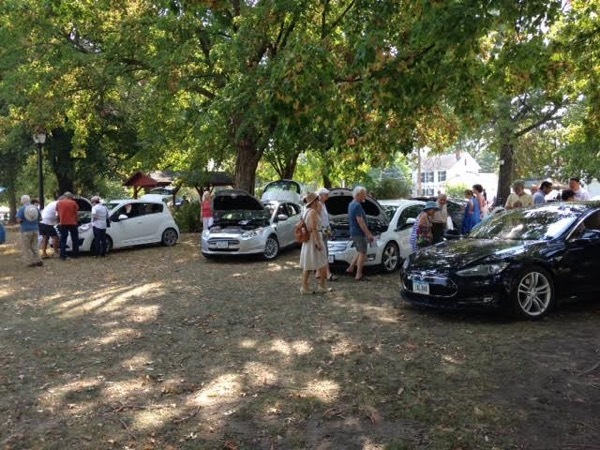 We wanted to give attendees a clear message that choosing electric/solar alternatives is something they can and should consider when purchasing their next car. We'll have all-electric Nissan LEAFs, an all electric Chevy Spark and a plug-in Chevy Volt and Ford Fusion parked at the Farmers Market. There will be an informal talk about the cars at 11am and opportunities to get in the cars, drive them and talk with electric car owners. If you have an electric car you are welcome to join the event. Register to attend and bring your car - or ask owners about theirs - by clicking the blue button at the top of this page and you'll be entered to win a chance at a $250 gift card. Registered attendees report 12,547 electric miles driven.